A PENINSULA IS AN area of land that projects out into a body of water that surrounds it on three sides. Some peninsulas, like Baja California, are joined to the mainland only by a narrow neck of land called an isthmus. Others, such as INDIA, are connected to the mainland by a wide area of land. A cape is similar to a peninsula, but it is shorter and smaller. Some areas have many peninsulas and others have few. Peninsulas and islands make up more than one-third of Europe’s area. Kenai Fjords, in ALASKA, is made up of many jagged peninsulas formed by the ice fields. As the glaciers in the area recede, the fjords deepen. This enlarges and exposes the peninsulas that reach out into the sea. Peninsulas are formed in other ways, too. In some areas along the shores of the ocean, limestone and clay form the foundation of cliffs. Capes and peninsulas are formed as erosion wears away some of the clay and limestone. The higher the shore and the harder the rock is, the slower the rate of abrasion will be. Some peninsulas are formed when mud and sand are deposited between a series of islets, making a solid land mass. Others are formed by rivers. Erosion sometimes causes a peninsula to break off from the mainland and form an island. The Arabian peninsula is the world’s largest peninsula. It is made of crystalline rock that developed the same time the ALPS did. The Arabian Peninsula used to be joined to North Africa When geologic movements caused a fault in Africa, called the Great Rift, the RED SEA was formed. The Great Rift runs from the Jordan valley to Central Africa. Geologists believe the whole peninsula is rotating slowly counterclockwise and in about 10 million years, the Persian Gulf will be closed off and become a lake. The country of SAUDI ARABIA takes up over half the area of the Arabian peninsula, but it shares the peninsula with other countries. They are JORDAN, ISRAEL, LEBANON, SYRIA, KUWAIT, BAHRAIN, QATAR, UNITED ARAB REPUBLIC, OMAN, and YEMEN. The FLORIDA Peninsula reaches from the mainland of the UNITED STATES out into the ATLANTIC OCEAN and the Gulf of Mexico. It is a limestone plateau, formed many years ago when the area was covered by a shallow sea. The limestone, which is several thousand feet thick, is made up of the bodies of tiny sea creatures deposited over a period of millions of years. The limestone in Florida is only 50–60 million years old, compared to limestone in Kentucky, which is 430 million years old. The Florida limestone is very soft and very white. Scientists say that about 200 million years ago, Africa and North America collided, then drifted apart again. A piece of Africa broke off and became the basis for Florida, deep under the ocean. It was on this piece of land that the limestone built up. About 30 million years ago, enough land had been formed to rise above the level of the ocean. During the past 30 million years, Florida has alternately been covered with salt water and been dry land. Today Florida’s position between the Atlantic Ocean and the Gulf of Mexico, combined with its pleasant warm climate, has made it a prime tourist area. Many retirees relocate to Florida every year. On the opposite side of the United States is a very different peninsula, called Baja California. The Baja Peninsula is part of Mexico. This is a long narrow peninsula extending south from the American state of California. Some scientists think that it used to be part of the mainland of MEXICO. They believe a rift developed and the peninsula moved away from the mainland. This took tens of millions of years. The gap filled with water and became the Gulf of California. 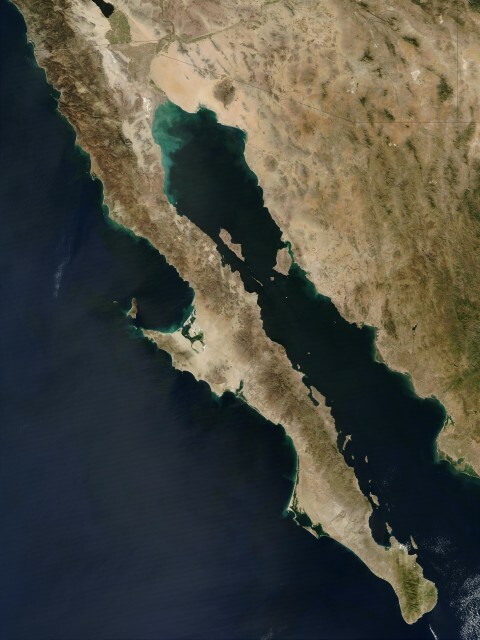 Baja California developed its present shape during the last 5–10 million years. The peninsula tilted westward, forming fault block mountains. It is believed that the Baja Peninsula will eventually become an island.